Kristine Barnett’s son Jacob has an IQ higher than Einstein’s, a photographic memory, and he taught himself calculus in two weeks. At 9 he started working on an original theory in astrophysics that experts believe may someday put him in line for a Nobel Prize, and at age 12 he became a paid researcher in quantum physics. But the story of Kristine’s journey with Jake is all the more remarkable because his extraordinary mind was almost lost to autism. At age 2, when Jake was diagnosed, Kristine was told he might never be able to tie his own shoes. The Spark is a remarkable memoir of mother and son. Surrounded by "experts" at home and in special ed who tried to focus on Jake’s most basic skills and curtail his distracting interests - moving shadows on the wall, stars, plaid patterns on sofa fabric - Jake made no progress, withdrew more and more into his own world, and eventually stopped talking completely. Kristine knew in her heart that she had to make a change. Against the advice of her husband, Michael, and the developmental specialists, Kristine followed her instincts, pulled Jake out of special ed, and began preparing him for mainstream kindergarten on her own. Relying on the insights she developed at the daycare center she runs out of the garage in her home, Kristine resolved to follow Jacob’s "spark" - his passionate interests. Why concentrate on what he couldn’t do? Why not focus on what he could? This basic philosophy, along with her belief in the power of ordinary childhood experiences (softball, picnics, s’mores around the campfire) and the importance of play, helped Kristine overcome huge odds. Is It Okay to Like a Story, but Hate the Writing? All the reviews I read elsewhere barred me out: masses of readers LOVED this story and could find no fault in it. They raved about the wisdom and enthusiasm and wonders of a mother who "discovered" that her autistic child was, in fact, a genius and helped him attain great feats. Quite a few HATED this story: they thought it was a lie, or an exercise in boasting and appeal for fame. I disagreed with all. My reading of the book fluctuated between astonishment, excitement, doubt, boredom, and a wish that the amazing mother would have found a capable ghost writer. I personally concluded that the story is largely accurate, and that the accomplishments and admiral insights of a dedicated mother and child motivator are mostly legitimate. In reaction to the writing itself, I felt that her plethora of unwarranted adverbs stretch otherwise interesting events into the frayed fragility of an overstretched elastic, and that her repeated description of tragic hardships is delivered with mind-numbing heaviness. Crowning this tone is the narrator's monotonous, martyr-like voice, and the author's inability to bring important characters--such as Jake--to life. in other words, we readers are allowed to "see" nothing occur, but only be told, and told, and told a long series of events. I wanted this book to end long before it did, though I waded on in honor of the truths available. There is a great deal of intellectual insight to be discussed--by those with merit--concerning the overall message of the author's book and the danger and hope available in examining the wisdom in some of the author's decisions as applied to autistic persons worldwide. There were many events that had potential brilliance in their telling. I wish I could have found more of them. Each parent should get a copy of this book when leaving the maternity ward. A testament of how much the parenting matters. Must read! 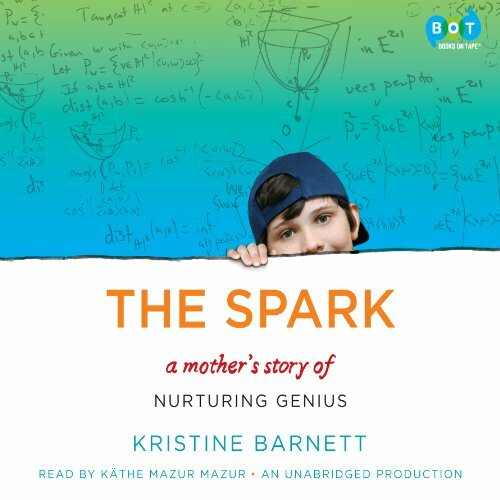 Would you consider the audio edition of The Spark: A Mother's Story of Nurturing Genius to be better than the print version? This book is so inspiring, Jake's mother, the voice of the book, is so kind it just makes you want to do more & see others in a new light. So happy I read it. The narrator is great, the story is well written & everything else about the book is just wonderful. I recommend it very much. The mother making such a connection with her son & listening to what he needed by dancing with the fire flies. What did you like best about The Spark: A Mother's Story of Nurturing Genius? What did you like least? The Spark was an interesting revelation of what the mind of an autistic child is capable of, and the need to reach them at their own level. I had several problems with it, mostly that I became very fed up with this woman's apparently bottomless capacity for self-congratulation. The book also risks giving parents of autistic children the impression that if they only try harder, their child can become a prodigy too. I did not finish the book, as after a while it provided no new information, just endless self-promotion. This book is extremely encouraging to any parent that is struggling with a child that does not fit into the “norm”. So often we try to steer children away from something they love, but we see as a waste of time or useless. However, if we take the authors advice, we need to build on the child’s interests, to find some way to relate his or her interests to the world. I love how Kristine gets to work immediately to change things when she sees there is a need and there might be some way she can help her son. She doesn’t wait for a therapist or professional, but decides to do whatever she can to make life better for her child and others as well. This is a truly inspirational book and I highly recommend it. What a Parent and what a Kiddo! What made the experience of listening to The Spark: A Mother's Story of Nurturing Genius the most enjoyable? This book is enjoyable because it offers hope to both parents of children on the spectrum as well as the children themselves. Not every child is going to be a genius, however, they will offer something of value to this world if given the tools necessary. Kristine wasn't a wealthy person, nor particularly knowledgeable about Autism (by her own admission through the book), but she did study as much material as she could find and worked with what she had around her to help her son, Jacob, become as successful as he could be. What was one of the most memorable moments of The Spark: A Mother's Story of Nurturing Genius? The most memorable section was when Jacob was working on his original theorem and was writing all over his room. Kristine liken it to the scene from "A Beautiful Mind" and I would have to agree, that was the imagery that immediately came to mind. My favorite part was when they go to look at Mars for the first time, I had a similar experience with my son at a meteorologist led seminar recently. Right from the start, the book grabs you and moves you when the mother opens up the book with a story of her small child conversing on an intellectual with college students. If you have a child on the spectrum, read this book. If you know someone who does have a child on the spectrum, read this book, then give it to them to read. The more people who know that they have a chance to make something special happen, the more that something special could actually happen. This book left me speechless. It is an amazing story and every mom should read it. It should be taught in schools. I salute the mother and I think she is an exceptional human being. Every single moment was an Aha moment. Very informative, entertaining and enjoyable read! This book changed how I view autism. Be sure to listen to the very end to hear Jacob himself. Thank you to Jacob and his family for sharing. This book was truly amazing! As a parent, I truly agree with the statement that not all children fit in the little box that the public schools want to put them in. My son learns differently than others and does not understand math, unlike the child in this book, however, I try to find new ways to incorporate math that he can enjoy. I will be recommending this book to all parents!